Creating apps and integrations for Slack is super easy. You can have webhooks or slash commands working in no time! But wouldn't it be great if development could be simplified even more by allowing you to test your requests directly from your machine without constantly redeploying your work to a hosting platform/webserver? Enter ngrok. This handy tool lets you set up a secure tunnel to your localhost, which is a fancy way of saying it opens access to your local app from the internet. Download and setup ngrok on Mac. Set up a simple HTTP server with node.js. 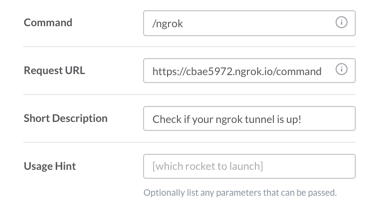 Create a slash command that sends a request to your new ngrok address and a simple message back to Slack. By the end of this tutorial you'll be comfortable creating, working and running Slack apps locally before putting your app out there. Go to https://ngrok.com/ and download the version that corresponds to your platform. In our case, we'll be downloading the Mac OS X 64-bit version. a) You can extract ngrok into the folder of your preference and run ngrok from there. b) (Recommended) Extract ngrok on your system's $PATH directory. 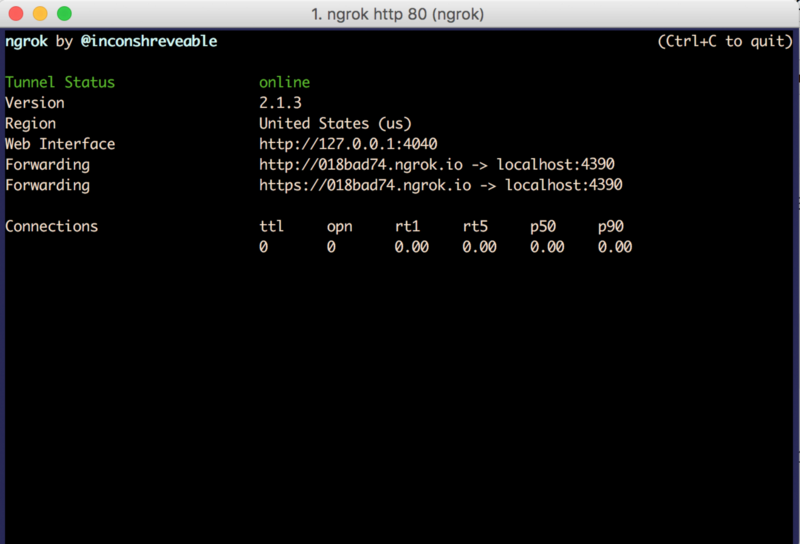 The advantage of going with this option is that you'll be able to run ngrok from any path on the command line. It's time to run ngrok and let the magic happen. The Online is a good sign! It means the tunnel is working and your app is now accessible at that particular 4390 port. The address to access it from the internet would be the one next to Forwarding, with ngrok.io domain. In my case: http://018bad74.ngrok.io. If we open up the Web Interface, we'll see that there are no requests since we haven't made any requests to our new ngrok address. Let's just click on the first HTTP url there to make a simple GET request from our browser. Mmm... something has gone awry. Fear not. While we've tunneled our app to the internet through that port &mash; we really don't have any app running yet! We'll need to create a web service that points to that port. Let's set up a simple web server to processes all incoming HTTP requests. For this part you'll need a code editor such as Sublime Text or Brackets. We'll be using Node.js to develop our app, so you'll need to make sure you've installed it on your machine as well. // First we need to import the HTTP module. This module contains all the logic for dealing with HTTP requests. // We define the port we want to listen to. Logically this has to be the same port than we specified on ngrok. // Callback triggered when server is successfully listening. Hurray! 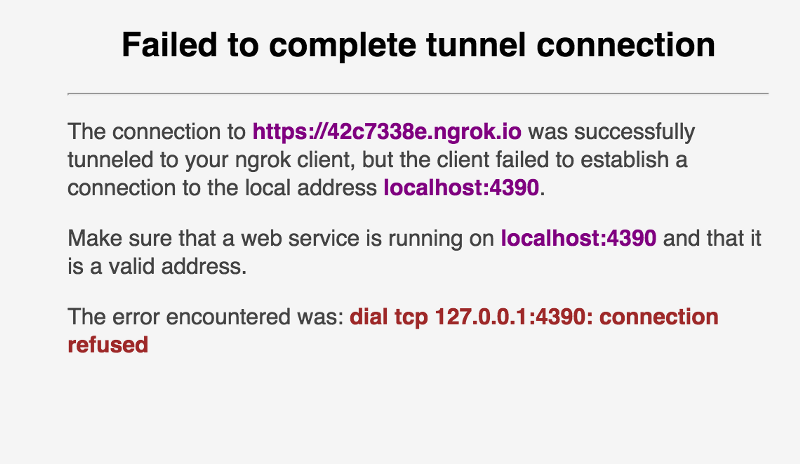 Now try visiting your ngrok address once more and you should be pleasantly surprised with a Ngrok is working! message. Well done! Now that your local server is exposed to the internet, let's create a simple app with a slash command that gets a message from your server to confirm it's operational. First, we'll need to modify our script so it can interact correctly with Slack. To keep our code short and sweet, we'll use a couple of essential third-party modules: express and request. Express is a web application framework that allows us to set up a simple web server. It makes it easy to set up the routing logic we need for the requests we'll receive from Slack. request is a convenient module to make HTTP calls. We'll use it to interact with Slack's web API. Let's go through a few simple steps to create an app from the Slack side. It's important to note that the app will remain private — submitting an app to the App Directory is an entirely different process. Creating an app will provide us with the Client ID and Secret we need to input in our script on the second step and it's where we'll input our different ngrok endpoints. Click on Create new App on the top-right hand-side. Select the team you'd like the app to be associated as its creator and fill all remaining fields as shown below. You can change the description if you wish to. For now we'll leave the links to support and installation instructions blank as we're just using this app for testing purposes. Click on Create App towards the bottom. Now let's bundle a slash command with our app. Click on Slash Commands on the left menu -> Create New Command and fill the form as indicated below — just make sure that the Request URL matches your ngrok route and this time is pointing to the /command endpoint. We need to get one final piece of information for our app. Click on Basic Info on the left menu, copy your Client ID and Client Secret, and pass them as the corresponding variables on our script next. // Store our app's ID and Secret. These we got from Step 1. // For this tutorial, we'll keep your API credentials right here. But for an actual app, you'll want to  store them securely in environment variables. //Callback triggered when server is successfully listening. Hurray! // This route handles get request to a /oauth endpoint. We'll use this endpoint for handling the logic of the Slack oAuth process behind our app. // We'll do a GET call to Slack's `oauth.access` endpoint, passing our app's client ID, client secret, and the code we just got as query parameters. Do not upload this file to a public GitHub repository until you relocate variables such as the Client ID and Secret to environment variables. Keep your Client Secret safe! Run the node script once more. Before we can run the slash command, we'll need to authenticate against our app to add it to our team. There's an easy way to generate the authentication link. Click on the Add to Slack button to go through the OAuth process and add the app to the team of your preference (it doesn't have to be the team used to create the app). Well done — you've created a app that's actually running from your local server. You could just modify the response above, save the file, run your node process once more and when using your slash command the changes would be immediately reflected. Neat! Now there's nothing stopping you from building more complex apps and use your new local development environment to test features like message buttons, using an ngrok route as your message action URI instead without any hassles. Try it out and experiment.